I first learned about the Lasang Pinoy (Pinoy is local slang for Filipino) food blogging event from Karen of The Pilgrim’s Pots and Pans when my blog was a mere 2 posts old. The idea was still being fine-tuned, to be launched on Ninoy Aquino day, details still in the works, but would I like to join? Oooh, I was a bit scared (I have never really cooked Filipino food, shame on me) but this was a Pinoy food blogging event, and I am Pinay (slang for Filipina), so I was definitely in. No questions about it! You can learn all about this event and what it stands for here. For me, Ninoy is the epitome of all the good things a Filipino can achieve. He remains my inspiration and his words, “The Filipino is worth dying for”, remains a mantra to keep the faith and do the right thing even if all odds seem against you, and to see the awsome beauty in a country that has so much to offer but is sometimes buckling beneath the weight of difficult times. I am not well versed in politics so perhaps my views are a tad idealistic but there you have it. Here is a collection of personal stories about what transpired during that time, put together by Perla Daly. It includes her own story, plus those of others who have shared their stories with her. I never got the chance to “take to the streets” during the 1986 rallies (my parents locked me in the house, I was 11 or 12 then) so I don’t really remember a particular food associated with that time. I chose instead to feature a typical Pinoy snack that is sold on the streets (to represent the rallies) and is sweet (to reflect the Filipinos sense of “laughter in adversity” — we have the sweetest smiles and the easiest laughs here…come see!). And of course, there’s the yellow ribbon…representing the song “Tie a Yellow Ribbon ‘Round the Old Oak Tree”, which became an anthem of sorts for Ninoy’s return after his three-year exile in Boston. 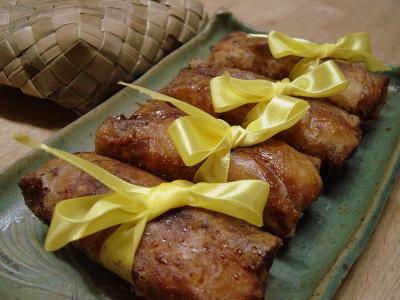 Turon is a typical Pinoy sweet snack that vendors peddle in street corners across the city. These yummy bundles consist of saba bananas coated in brown sugar, wrapped in lumpia wrapper (springroll wrapper), and fried. Langka (jackfruit) is also added sometimes (although I didn’t add any to mine). My Yellow Ribbon variety has a special something though. Just as Filipinos often add laughter in their lives to counteract hard times, I too have added some extra sweet bits to give this snack added oomph! The “sweet bits” I refer to are none other than Choc-nut, Curly Tops, and Flat tops! 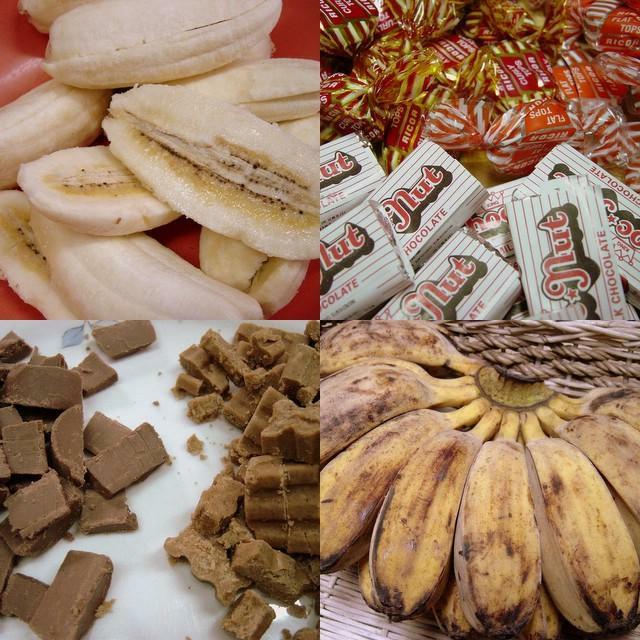 Every Filipino around the globe will recognize these local favorites. These are snacks that smack of my childhood. I have cousins in Spain that demand Choc-nut every time someone visits. Curly Tops and Flat Tops are the only things that got me through accounting exams in college. Suffice to say that they have a cult-following. Choc-nut is basically labelled as “peanut milk chocolate”. The peanuts are ground up but you can still feel a little of the roughness. Flat Tops and Curly Tops are local chocolates made by Ricoa and bear the tag line “Rich Chocolate, for the chocolate lover” (woohoo! that’s me!). Also, there is no distinction in either taste and appearance between the Flat and Curly Tops. Hmmm…this fact remains unexplained to me to this day. Anyhoo, much like the rest of our dishes, although a little mysterious and sometimes unexplained, they are damn good! – Spread the brown sugar in a bowl wide enough to lay the banana slices in. 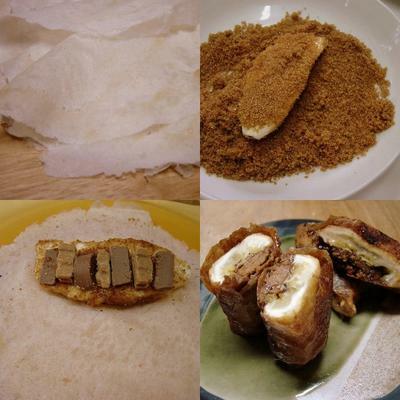 – Coat a slice of banana in the brown sugar. – Fold wrapper and banana over once, then fold the side ends in, then continue folding until you reach the end of the wrapper. Seal the end with water. – Repeat procedure with the rest of the banana slices.